A extravagant three tiered stacked wedding cake. A large bouquet of sugar flowers including Lisianthus, Freesias, Cala lilies and Roses flows down the three tiers enclosed by a heart shaped cage of bear grass and delicate beads. 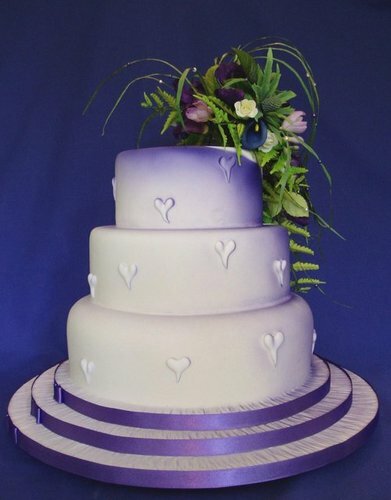 The sides are decorated with run-out hearts highlighted by purple airbrushing complementing the flowers.